Arthritis can affect dogs and cats of any age, although we frequently think of it as a disease for older animals. It can be mild and unnoticeable, or it can be debilitating-severely affecting your pet's quality of life. In both cases, the earlier the prevention or treatment is started the better. Dogs are more susceptible to arthritis than cats, and the larger dog breeds are more vulnerable than smaller breeds. Cats suffering from arthritis tend to show signs in different ways than dogs. Whether you have a cat or dog, early detection is important. The most common signs of joint disease include stiffness, limping, or favoring a limb - particularly after sleep or resting, inability to rise, reluctance to jump or even climb stairs, and noticeable pain. Arthritis is a painful, degenerative joint disease or deterioration of the joint and can hinder movement and cause your pet pain. Almost all dogs and cats will develop varying degrees of arthritis at some point in their lives. Arthritis is more common among older dogs but younger and middle aged dogs have also been known to exhibit the symptoms of arthritis. Unfortunately, many of the cases go undiagnosed because owners attribute the subtle changes in their dogs to be signs of old age, or merely a case of slowing down. There are several types of arthritis that can affect your dog, which include Osteoarthritis, Degenerative Joint Disease, and Hip Dysplasia. Other joint diseases that occur in dogs are Elbow Dysplasia, Knee Dysplasia, Knee Stifle, Osteochondrosis, Hypertrophic Arthritis, Shoulder Degeneration, Wrist Arthritis, and Kneecap Dislocation. 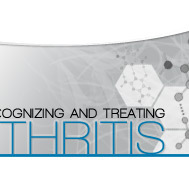 Osteoarthritis: A chronic condition that progresses slowly. As the condition prolongs, the bony structures rub against one another, therefore causing discomfort to your pet. Joint Disease: Caused by the breakdown or destruction in portions of the joint. This condition does not necessarily mean that your dog is suffering from any kind of inflammation. Hip Dysplasia is a disease that affects the ball and socket joint in your dog. This condition causes numerous complications and discomfort to your dog. In this case, inflammation is common, calcium build-ups take place, your dog experiences muscle pain, and the tissues in the surrounding areas begin to break down. These joint diseases occur mainly in large dogs such as German Shepherds, Rottweilers, or medium sized dogs such as Labradors. However, this does not necessarily mean that other breed of dogs would not experience joint diseases. Arthritis can occur to any breed, of any age. The first step towards treating your dog to relief from arthritis is to actually learn the symptoms that occur in arthritis. 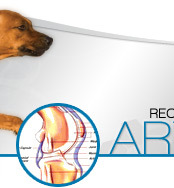 Veterinarians have developed a list of signs that might indicate that your dog has arthritis. Any dog can develop arthritis, and knowing the signs and symptoms of pain will help you determine when your dog may need immediate attention. Does your dog tire easily or lag behind? 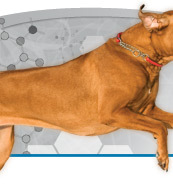 Does your dog limp or appear stiff after activity? Is your dog reluctant to climb steps or jump up? Is your dog slow to rise from a resting position?